"Lose Weight Gradually - Age Well"
When trying to lose weight, the road to success is dotted with many tempting parking places. . . . Author Unknown. As you age, it becomes more difficult to lose weight and keep it off. The build up of fatty tissue around the middle, known as middle-aged spread, not only makes you look older, but it increases your risk for a variety of illnesses. Being obese or overweight puts an extra stress on your body and makes you more liable to suffer from Type 2 diabetes, high blood pressure and other age-related illnesses. The extra weight will also put more stress on your articulations, which often leads to complications. However, before deciding to lose weight, make sure that you need to do so by working out your Body Mass Index (BMI). It is a good idea to enlist the help of a medical practitioner, especially if you are obese. Your doctor will help you work out your BMI and to set achievable goals for your height, weight and age. With today’s emphasis on youth and the shapeless, pre-adolescent figure, you might think you are overweight when in fact you have a healthy weight for your age, height and build. You can use the BMI to find out if you're a healthy weight for your height. To do this, divide your weight in kilograms by your height in metres and then divide the result by your height in metres again. For example, if you weigh 72kg, and you're 1.74m tall, your BMI would be 23.7 (72/1.74 = 41.3 and 41.3/1.74 = 23.7). Anything over 25 means you are overweight. If your BMI score indicates that you are overweight, the best way to lose weight is to eat a healthy, balanced diet and take plenty of regular exercise. The exercise will burn off calories and, if you stick to the same amount of food, your body will take the excess energy it needs from your store of fat, thus reducing your weight. Here are some weight loss tips to help you lose weight safely. The first of our weight loss tips is to exercise regularly. The minimum amount of exercise that you should do is 30 minutes a day. This could be walking briskly, not strolling, power walking, Nordic walking, cycling or swimming. Walk or cycle to work or, if it is too far, park the car or get off the bus several blocks away, and walk the rest. Use the stairs instead of taking the lift. To lose body fat you need to use up more calories than you are taking in. If you have a lot to lose, join a gym and work out several days a week, take up dancing, martial arts or water aerobics. 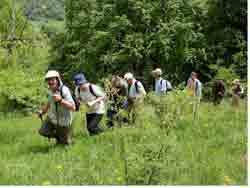 Go hiking at the weekend instead of being a couch potato. Taking part in an organised aerobic or other exercise class will help you to exercise safely. Build up your muscles by starting at a low level and increase the intensity and length of your workout gradually. It is important to warm up before you start and stretch out your muscles after you finish the more strenuous exercises. This will help to prevent stiff and sore muscles, or even more important conditions that might make it difficult to continue with your programme. Don't be discouraged if you don't lose many kilos at the beginning as muscle is heavier than fat. In fact you might even gain a little in the first week or two for this reason. However even if you gain a kilo you will notice that you will still look slimmer. After the first one or two weeks, you should start to lose kilos as your body fat is replaced by muscle. The second of our weight loss tips is to include weight bearing exercise. Weight bearing or resistance exercise is particularly recommended as we age, as it helps keeps your bones healthy and prevents osteoporosis. If you make exercise part of your daily routine and eat healthily, not only will you lose body fat, but also you will be able to stabilise your weight so as to avoid the yo-yo effect. You are more likely to stick to an exercise routine if you choose activities that you enjoy or if you exercise with a friend or a group. Other people can help to keep you motivated. If you have the money and really lack motivation, consider a personal trainer, at least until you have the habit of exercising regularly. The third of our weight loss tips is to eat healthily. Learn how to eat well and you will be learning how to age well. Eat a variety of food both to increase enjoyment and to be sure of getting all the nutrients your body needs. Read about the various Superfoods and try to include as many of these into your diet as possible. You should make sure you eat enough fiber, carbohydrates and protein and aim to include at least five portions of fruit or vegetables a day. If possible choose low fat, low sugar and low salt food options. Make sure that you use unsaturated fats, such as olive oil and avoid saturated fats like butter. Try to eat less processed foods and include more unadulterated Raw Foods into your diet. My mother used to tell us that we should always leave the table feeling that we could eat more and this is not bad advice. Try to eat slowly and avoid eating in front of the television. This is because it takes 20 minutes for your body to realize it is being fed and this does not happen at all if we are engrossed in a TV programme, so your body will not send out the message that it has eaten enough, and you might have a tendency to overeat. Chew your food well, rather than swallowing it quickly and your appetite will be sated with less food. Avoid crisps, chocolate and cakes as part of your regular diet and keep these for special occasions. Eat five portions of fruit and/or vegetables a day to make sure you are getting the correct nutrients. 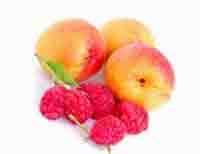 They're a good source of vitamins and minerals, including vitamin C potassium and folate. They are also a great source of fibre, which is necessary for a healthy gut and helps prevent constipation. A fibre rich diet can also reduce your risk of bowel cancer, heart attack, stroke and some other cancers. Fruit and vegetables contribute to a healthy and balanced diet. 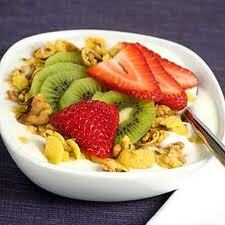 Another of our weight loss tips is to always eat breakfast. My mother also told us that breakfast is the most important meal of the day. Eat cereals enriched with oatmeal, which is extremely good for the heart and increases the metabolism, only brown wholemeal bread and low fat milk, fruit or fruit juice. Juice should be freshly squeezed or, if bought, 100 pure juice without added sugar. Those who cannot face breakfast first thing in the morning can take this meal a little later. However, if you get into the habit of eating a healthy breakfast soon after you wake up, your body will soon be sending out hunger signals at that time. Some of our readers have contributed healthy breakfast recipes you may want to consider. The main meal of the day should be taken at lunchtime, if possible, with a lighter meal in the evening. If this is not possible, try not to eat dinner too late in the evening. It is very important to drink plenty of water – two liters a day, which many elderly people find difficult as they do not feel thirsty. However it is extremely important. Try diluting fruit juice with still or sparkling water to encourage yourself to drink more. Always take a bottle of water with you when you go out walking or visit the gym. Finally, cut down on your alcohol intake, as alcoholic beverages are extremely calorific. It may go against the grain in this age of instant gratification but the mext of our weight loss tips is to do it gradually. Research has conclusively shown that crash diets do not work. You may lose the weight, but you will rapidly regain it once you resume your old eating habits. Fad diets that involve eating only one or two food types can be harmful, as you will not be getting all the nutrients you need. Eating a balanced healthy diet that helps you reach your ideal weight gradually is the best way to have lasting results and is the essence of all our weight loss tips. Losing fat slowly is better for your body and your overall health. Slimming pills should only be used if prescribed by a health professional. 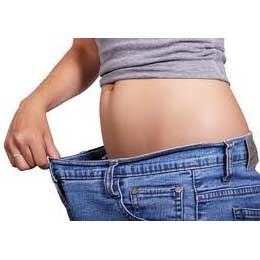 Don’t buy into remedies that promise quick weight loss solutions. Remember, if it sounds too good to be true, it probably isn't true. Mary Treacy is the founder and contributing editor of age-well.org. She has over thirty years of experience working with non-profit, non-governmental organizations (NGOs), mainly business associations, and is an experienced writer in many sectors including co-operatives, agriculture, commmerce, housing, insurance, banking and health. You can find her on Google + and Twitter.